The Kukri style knife has a rich and romantic history. Designed for warfare, it is the prized possession of every Nepalese Gurkha soldier, past and present. On the other hand, a machete also has an exhilarating history as a weapon of war. It was used in a number of confrontations, from the Rwandan Genocide to the Battle of Havana. Ka-Bar inventively took the ideas of each of these powerful knives and interweaved them into one. Thus was born the Ka-Bar Kukri Machete (Model 2-1249-9), a knife containing the shape of the Kukri, the ferocity of a machete and the chopping power of an ax. Read on to find out what makes the Ka-Bar Kukri Machete a very competent tool for heavy yard work, clearing bush, chopping and trimming. The overall length (from the end of the handle to the tip of the blade) of this Ka-Bar Kukri Machete is 17 inches. The blade alone is 11.5 inches long and 0.165 inches in thickness with an edge angle measuring in at 20 degrees. It features a full tang design with partial flat grind. The entire tool weighs roughly 1.2 pounds (20 ounces). The blade of the Ka-Bar Kukri Machete is made of 1085 carbon steel. This kind of steel is quite similar in composition to 1095 Carbon. However, many experts have expressed that 1085 is tougher and less likely to chip than the 1095, but falls short in the edge retention category. It is also worth noting that carbon steel, unlike stainless, is highly susceptible to rust. This can easily be combated by slathering a bit of oil over the blade and ensuring the knife stays as dry as possible when stored away for extended periods of time. Ka-Bar has also applied a black powder coating to the blade of their Kukri Machete. This coating will greatly reduce the risk of rust and other damage as long as the coating remains intact. Still, seeing as most of these coatings tend to wear off over time with heavy use, I would recommend practicing proper maintenance, cleaning and storage procedures for any carbon steel blade. That being said, 1085 carbon steel is an extremely durable, affordable and formidable blade steel. The shape of the blade is uniquely designed to give as much power to the wielder as possible. It begins at a familiar rectangle shape then, as the top continues on a straight line, the bottom sweeps into a wide curve. By about halfway through the blade, the top begins to drop and meets the bottom at a sharp point, where much of the weight of the blade lies. The sharpened edges begin where each side starts to curve. I was also surprised by the sharpness of the factory edge. Razor sharp with no need for any additional honing. It comes with a much sharper blade than can be found on most kukri knives, especially when you consider some do not even come sharpened! The Ka-Bar Kukri Machete features an elegant, pitch black handle made from Kraton G. Kraton is a durable rubber material that provides the perfect grip without feeling sticky. This material is so adept at battling against slipping that it doesn’t matter if you are holding it with wet or dry hands. The handle is exceptionally long and thick with an obvious curve at the very end, aiding greatly in comfort, traction and peace of mind knowing it won’t easily slip from your grasp in the middle of a hard swing. It also has a convenient lanyard hole that can be used for either decorative or practical purposes with a strand of paracord. To ensure both safety and longevity, this kukri machete comes with a sheath. The sheath is made from a mixture of black leather and cordura. Like the handle and blade, it is a sleek black color. There are two snaps used for securely holding the knife in place. One located close to the handle and the other at the portion of the blade where the top begins to curve down. There is a D-ring with a belt loop threaded through it at one end and another D-ring attached to the pointed end of the sheath for attachment purposes. The sheath is definitely an area Ka-Bar could improve upon with this model as it seems a bit lacking in features and attachment points. Nothing fancy, but I guess it gets the job done and should hold up well enough under normal use. I wouldn’t stress it too much as it does seem to be somewhat on the flimsy side. A kukri machete such as this Ka-Bar 2-1249-9 is primarily used for hacking away at tough materials. It’s especially useful if you need to clean up a plot of land. This heavy duty knife can even chop right through trees as thick as 8 inches in diameter. Throw it in the trunk of your car just in case a tough job comes up or you get into a compromising situation. You could also bring it with you on a camping trip as it’s the perfect tool for obtaining firewood, clearing camp sites or fending off wild animals. It is more or less capable of doing the work of a small ax or hatchet. If you’re an avid hunter, this knife could even aid in breaking down large carcasses into manageable sections. The possibilities are endless. It’s no secret that both the machete and the kukri pack a powerful punch. But mesh them together with high quality construction and materials Ka-Bar is known for and you have a near indestructible knife on your hands. 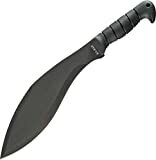 The Ka-Bar Kruki Machete is one such knife. Its sleek design, tough materials, and rock solid build quality ensures an accurate, clean cut every time. However, even this chopping machine has its drawbacks. Due to the use of 1085 carbon steel, it can get rusted fairly easily if not properly maintained. To be fair pretty much all kukri knives use non-stainless high carbon steel making them very tough and durable to resist chipping, but becoming more susceptible to rust and discoloration in the process. The blade coating makes this a nonissue at first, but given time the coating will begin to wear like they all do with enough hard use. That’s when the carbon steel will become exposed to the elements and require even more attention to prevent corrosion. Also, the blade does tend to dull a little quicker than I would like and due to the kukri inspired shape can be a bit of a pain to sharpen consistently. But it isn’t particularly difficult to get a razor sharp edge from this blade steel with just a little practice. The sheath, like with most inexpensive knives of this size, is rather mediocre and boring, but it functions decently enough for regular use. Still, I would say the upsides of this tool highly outweigh these minor nitpicks considering the value you’re getting. Priced at or below $50, the Ka-Bar Kukri Machete provides excellent performance for the price. Value for the money is high. Whether you need it to simply trim tree branches in your backyard or full on wilderness survival, the Ka-Bar Kukri Machete won’t let you down.